Almost sixteen years ago, Sir Knight and I were blessed with a wonderful little boy. Master Hand Grenade was perfect, but when he was 8 days old an unexpected illness left him compromised. After spending a week in the Neonatal Intensive Care Unit, his prognosis was dim. We was never to see, walk or hear. He would be plagued with seizures and there was not much of a chance of him ever living a normal life. God had other plans. We did our best to raise our son like the rest of our children. We expected things from him. We taught him to love God, his family and his country. As he grew, we saw a distinctively warrior mentality developing in him. I don't mean that he wanted to do battle with us, but instinctively he wanted to protect the innocent. He was willing to stand in the gap between good and evil. And in his four year old mind, that meant that he had to be a Marine. Not Army. Not Air Force. Not Navy. There was nothing on his horizon but the Marine Corp. Wanting to encourage our son, but knowing his limitations, we told him that God might have other ways for him to serve. We told him that God had called him to be a warrior, not for the Marines, but for God himself. Hand Grenade would soak this information in, enveloped in the knowledge that God had given him the spirit of a warrior, yet never losing his affinity for the United States Marine Corp.
All of Hand Grenades play revolved around being a Marine. He would dress up in camouflage (always 3 sizes too big), crawl through the trees on his stomach and shoot imaginary bad guys. He would arrange troops (rocks and sticks) in mock battles making sure that the Marines always proved victorious. He had me buzz cut his hair, making sure that I left the appropriate "helmet pad" and always strove to be "high and tight". The older Hand Grenade became, the more certain we were that he would never be able to enter the Marine Corp. He had the heart of a Marine, but his hearing loss and involuntary movements would make him ineligible to stand with his brothers in the Corp. He was undeterred. He knew that one day the Marines would see him for what he was - a fellow Marine, and they would have no choice but to accept him as one of their own. One day, when Hand Grenade was 10 years old, his childhood faith in the Marine Corp bore fruit. Hand Grenade was helping his Grandpa haul rifles into a gun show to set up a table, when they crossed paths with a retired Marine, arrayed in his uniform. Hand Grenade immediately grew tall, pulled his hand out of his pocket and saluted the Marine with a respectful "Sir". The Marine smiled down at the little boy in grubby BDU's, hands shaking and said, "Carry On". Hand Grenade beamed, as if the Lord himself had bestowed a blessing on him. During the course of the gun show, Hand Grenade's grandfather had an opportunity to talk with that Marine. He told him about the little boy with the heart of a Marine, but whose body would never cooperate with him to reach his goal. He told him about Hand Grenade's tenacity. His persistence in overcoming every obstacle. He told him about a little boy that didn't have the word "quit" in his vocabulary. He told him about a child who was a natural born warrior - who would always stand between the innocent and evil, no matter what the cost. As they talked, the Marine's eyes began to gleam. While the grandfather spoke of his great love for his grandson, an idea was born in the mind of the Marine. This Marine, this man of honor, would do what Marines do - he would stand up for the innocent. He saw, in this little boy, the soul of a Marine, and, as it was in his power to do something, he acted. About two weeks after the gun show, that Marine Corp. Lance Corporal (retired) called. He spoke of meeting Hand Grenade and his grandfather and he wanted to have a ceremony at our home to induct Master Hand Grenade into the Marine Corp. Excitedly (without telling Master Hand Grenade) plans were made. We washed and ironed Hand Grenade's best BDU's, gave him a fresh buzz cut and called my folks so that they could make plans to be here. The appointed day arrived. Electricity filled the air, although Master Hand Grenade had no idea why. Slowly, a car drove up our driveway, depositing a retired Marine, in full dress blues, at our front door. Master Hand Grenade opened the door and his excitement was palpable. He immediately recognized the Marine from the gun show and saluted without hesitation. After explaining the situation to Master Hand Grenade, the Marine proceeded to hold an induction ceremony for our son. As Hand Grenade stood at attention, he was inducted in the United States Marine Corp as an Honorary Marine with the rank of Lance Corporal. He was presented with a certificate documenting his induction, along with a cake bearing the Marine symbol - the Eagle, Globe and Anchor. Other Marines, hearing about a 10 year old boy that was really one of theirs, contributed to this occasion. One sent a DI hat (from WWII) another sent his Marine Corp ring. BDU's, packs, bricks of .22 - gifts just came flooding from the trunk of the Marine's car. Never before has a 10 year old boy overflowed with such grateful thanksgiving. The next year, when Hand Grenade was 11, he (and our family) was invited to be the guest of honor at the Marine Corp ball (in Montana). The Marines payed for our trip, donated our lodging (the hotel was owned by a former Marine) and even presented Master Hand Grenade with a beautiful, refinished .22 rifle. As he stood, side by side, with a Marine recently returned from Iraq, his induction into the brotherhood was complete. The Marine leaned down, whispered some pearl of wisdom into Master Hand Grenade's ear and Hand Grenade squared his shoulders, turned on his heal to face the Marine and saluted. In a moment of abandon, the two Marines embraced - one fresh from the field of battle, the other readying himself for a battle of a completely different nature. Over the years, the Marines have come into our lives to bless us and enrich us many times over. They have never forgotten that little 10 year old boy. He is one of theirs. They stand by their creed "Leave no man behind". Not only did they make a little boy theirs, they have never left him behind. Master Hand Grenade is now almost 16. He is tall and straight. He has the bearing of a Marine, although he will never be one. He is as earnest about standing between the innocent and evil as he was when he was 10. He is more of a warrior now than ever, but he has a new understanding that we battle not against flesh and blood but against powers and principalities. And, he is still a Marine. This year, our family was once again invited to be guests at the Marine Corp Ball. As Hand Grenade walked into the room, he was met by Marines in dress blues, clapping his back and shaking his hand. The hugged his shoulders and called him son. He stood tall, looked them squarely in the eyes, and knew he was home. Thank you. All the veterans of our armed forces, I salute you. Not only do you protect our way of life, you honor and protect what is most important to us - our families. You are what is best in us. I have tears in my eyes. Thank you for sharing this. i want you to know how good it makes me feel that there is a place in your families' hearts for us marines...does your hand grenade know that "once you are a marine, you will always be a marine"? i bet he does! semper fi enola gay! Enola, I have tears streaming from my eyes as I read this. Your son, you and your entire family are abunantley Blessed! I to have tears as I read this. May God bless those marines and Master Hand Grenade! It is obvious that God has a plan, and it's a GOOD one! My Grandpa and Great uncle were Army,my Dad and uncle were Navy.I knew since I was 10 that that I wanted to follow the family tradition of military service,even though I was a girl.I wanted to be a Marine.When I was 16 I was a candidate for early graduation,so I went to see a recruiter.They wouldn't accept me,I wasn't medically fit.So went to other recruiters,Army ,Navy, and the Air Force.They all refused me.I was so lost,and I started getting into trouble.Cutting school,dropping out,and then I got pregnant at 16.Almost 21 years later,that child my, only son enlisted in the Navy,and went to Iraq.Thank God he came home okay.Apparently I wasn't meant to serve in the military,but instead give birth to one that was. For the folks who were questioning whether this was plagiarized - my dad wrote (actually, my mom wrote it) the other account of our son and the Marines. It was never in the new or on TV (Marines are an honorable bunch and don't really want credit for their acts of kindness). You will not find it on Snopes or any other website. It is our story and ours alone. If you have questions, you are welcome to write to me, but please, don't question the honorable nature of the Marines, or for that matter, of our family. As a former Marine myself, I am deeply touched by this post. I spent 6 years in the Corps ('77 - '83) and it was an experience that is second to none. His Marine warrior soul is as big as the moon! What Marine would not recognize a kindred moon? Not one! Their corp values possess a special loyalty and brotherhood to their corp commitments. We WILL win our Nation's battles. We WILL develop quality citizens. awesome!! and Praise God for sending that little boy understanding parents and grandparents!! What a blessing Master Hand Grenade is. God certainly has His Hand on yourson. Sorry I didn't post your comment, but the link has our real names - an OPSEC concern ya' know! Yes, that is our story. My dad posted that (my mom wrote it). It didn't occur to me that people would make the connection! I have never told Hand Grenade's story in regards to the Marines. I have told of his illness and other bits and pieces, but I thought that his story would be a perfect way to honor our troops. I was rather mortified when someone thought that I had plagiarized something that someone else had written!!! Thanks for checking with me. What a beautiful story! 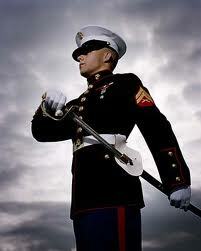 The Marines are our heros both on the battlefield and at home. God has blessed you and your family. May He continue to keep you safe and secure. Very touching. I shared this on FB. I have several family members, including my deceased Father who have served our country in the Marines. thank you for sharing. he may not have the body, but he certainly has the soul. The Navy and the Marines have a long history of punching one another (rustpickers versus jarheads) but when a Marine gets in trouble, you can count on the Navy to jump in. I forgot to mention I have a nieghbor whoose father was a Marine and fought in WW2. My neighbor was stricken with Polio when he was a child in the late 1940's and was permently disabled. My friend wanted to be a Marine like his father but his body would not let him serve. His dad knowing this got him a ham radio set at age 9 so he could stay inside the house and have something productive to do. That started my friend on his way to being a successful electronics technician (retired) and our local expert on electronics, ham radio and EMP. A man can still serve his community and be a very valuable asset without joining the military. I come froma line of military folks(none Marines,though)and, of the people I know who have been,or are, in the military(all branches),most are what I can the brightest bulbs in the human chandelier. It isn't ICBMs,or any other technological terror(they help) that keeps us free, it's the human elements that do. I shared this with TopDad (my own Marine) who got tears in his eyes and loved your story. Thank you so much for sharing such a personal glimpse of your family. Semper Fidelis. Always faithful. Not when it's easy or convenient or popular. Always. To our God, to our country and to the Corps. Thank you for the story.